Bread Pizzas are delicious pizzas made with bread slices as a pizza base and topped with a layer of Vegetables & Cheese. 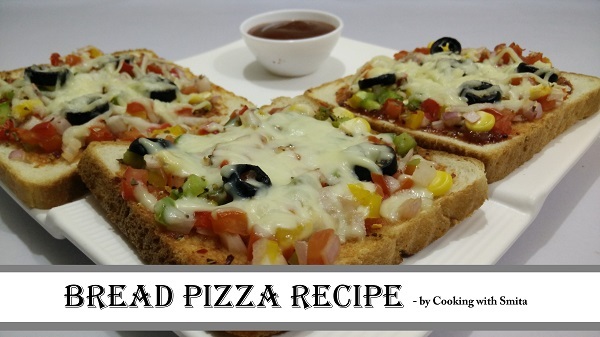 Bread Pizza is quick and easy to make recipe. It can be made in Microwave or on Tawa. To make Pizza Sauce, add Chilli Flakes, Oregano & Pizza Mix in Tomato Sauce and mix well. Add all chopped vegetables in a large bowl – Capsicum, Sweet Corn, Onion & Tomato – mix well. Spread Pizza sauce on bread slices. Add toppings ( a mixture of chopped vegetables) on bread slice. Bake in microwave till cheese melts. It will take about 8 – 10 minutes. To make Bread Pizza on Gas, apply some butter on Tawa and cook over the low flame with lid on till cheese melts. It will take about 8 – 10 minutes.